High tide combined with strong winds can often leave a line of debris on coastal shores around the world & today it was our turn. The beaches around Gaya Island are public & the responsibility to keep the area clean falls under the local authorities however the Downbelow team are always happy to assist & we do so on a daily basis year round. 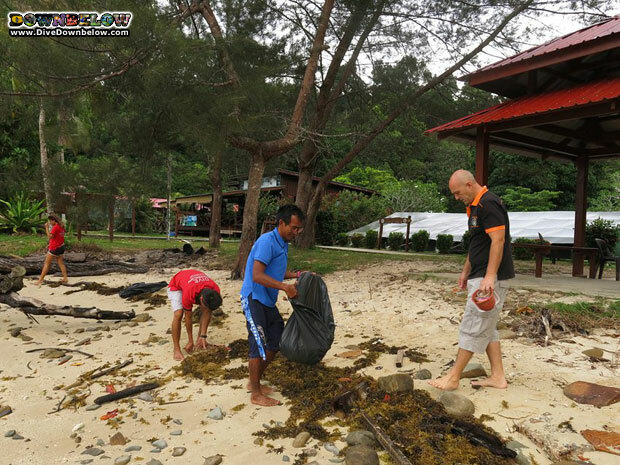 As responsible conservationists the Downbelow staff are happy to clean the beaches whenever possible but this month all our staff are joining in to support the cause & help tackle & raise awareness on marine debris. Trash comes from many sources but ultimately it originates from us humans & our seemingly endless desire for plastic products so please consider unnecessary packaging before purchasing & dispose rubbish wisely!